The Quebec Major Junior Hockey League celebrated the accomplishments of its brightest stars of the 2010-2011 season at the Golden Puck Awards Gala this evening, at the Hyatt Regency Hotel, located in the heart of downtown Montreal. Hosted by Christian Tétreault of NRJ Radio and Louis Jean of Rogers Sportsnet, it was a fun and friendly evening. Jacob DeSerres wins the Jacques-Plante trophy thanks to his goals-against-average of 2.22 in 30 games with the Sea Dogs. The Franco-Albertan, former goalie of the Brandon Wheat Kings of the Western League, won 27 games versus only three losses. Only 16 years-old, the Sags number 10 racked up 60 points in 63 games, of which 23 were goals. Hudon was chosen 6th overall in the first round of the QMJHL 2010 Draft. The Sea Dogs ended the season with 58 victories in 68 games. 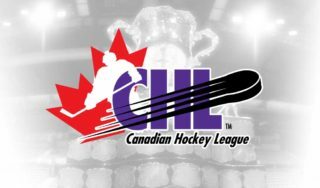 Last year, Gallant won the Brian Kilrea Coach of the Year Award of the Canadian Hockey League. 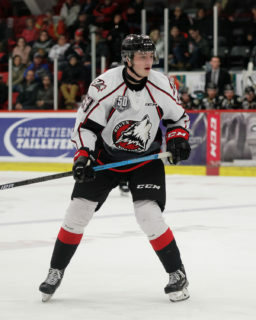 The forward from Sorel finished the season with 114 points. 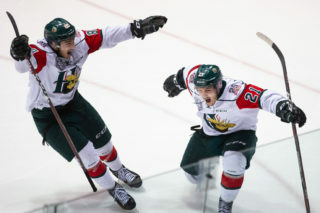 Devos, who spent four and a half seasons with the Victoriaville Tigres before being traded to the Olympiques, becomes the first scoring champion that played with two different teams since Patrick Lebeau in 89-90. Therrien played 68 games, scoring 12 goals and 32 assists for a total of 44 points. He played the entire season while maintaining a high academic standing. Lemieux accumulated 25 points in 63 games this season. He realized at the very start of his career that he could use his status as a player to create a positive impact in the community. His numerous philanthropic contributions have had a positive effect on his region. Defenseman Simon Després is the defenseman of the year. First choice of the 2007 Entry Draft, Després finished the 2010-2011 campaign with a showing of 41 points in 47 games and a +/- of +29. Després also represented Canada in the last World Junior Under-20 Championship in Buffalo. In regular season, Devos played for the Tigres and Olympiques, collecting 114 points but with only 31 penalty minutes. Devos finishes a 5-year career in the QMJHL in which he played 325 regular season games. Forward Sean Couturier takes the title of Top professional prospect. 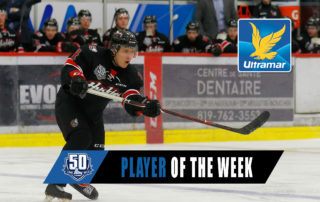 Ranked 2nd in North America by NHL Central Scouting this January, the Voltigeurs’ number 7 collected his second 96-point campaign in a row while playing in 10 fewer games this year due to his participation in the World Junior Hockey Championship. Mike Kelly built a first class team that just had one of the best seasons in the history of the League. In two seasons under his direction, the Sea Dogs have registered no less than 111 victories. This year to improve his team, Kelly acquired goaltender Jacob DeSerres, forward Alexandre Beauregard and defenseman Éric Gélinas. Leblanc had a busy season. He not only made his mark by helping his team climb to second overall by scoring 26 goals and 32 assists but also by contributing by being one of the best forwards on Canada’s Under-20 silver medal-winning squad. Sean Couturier takes home the most coveted trophy of all, the Most Valuable Player of the Year. In his third year in the league, the Voltigeurs’ first pick of 2008, scored 96 points in only 58 games. Couturier also finished with an exceptional +55. He helped the Voltigeurs to become the first team in league history to win at least 45 games three years in a row. 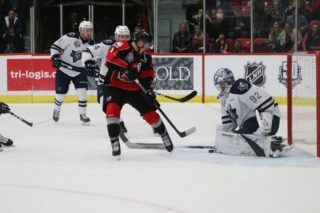 The Saint John Sea Dogs this year became the first team since the Quebec Remparts of the 97-98 and 98-99 seasons to win the regular season championship two years in a row. The New Brunswick franchise completed the season with an impressive record of 58 wins and 10 losses, including 3 in overtime. Moreover, the Sea Dogs played 34 home games without a single regulation loss. The John-Horman (Executive of the Year) and Jean-Sawyer (Marketing Director of the Year) trophies will be awarded at the Annual Entry Draft.